Comparing the two charts together, two conclusions can be drawn. The first is that rates are still the determining factor in volume. Notice that from 2009 to 2014 rates were significantly higher than from 2015 to 2016, and as a result, the overall percentage of yearly quotes for the first third of the year went up. This caused a much more balanced graph in the last two years than the five years prior, which saw a steady decline in rates from the year’s start to its end. However, what the most recent numbers also show us is that seasonality can actually have an effect on quote volume even if rates aren’t as low in those seasons. 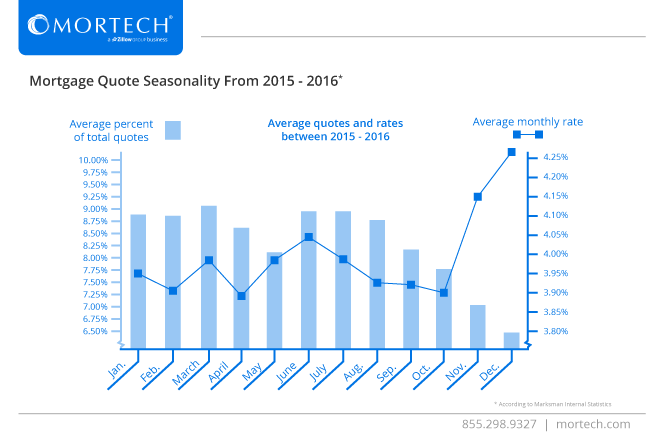 June was one of the biggest months for quote volume, yet the average rate was the third highest for the year. Conversely, October saw the third lowest quote volume over that same two-year stretch despite having one of the lowest average rates. This differs to the prior five-year stretch in which October saw some of the highest volume, however, the case for that boils down to the average rate being much lower than the other months. 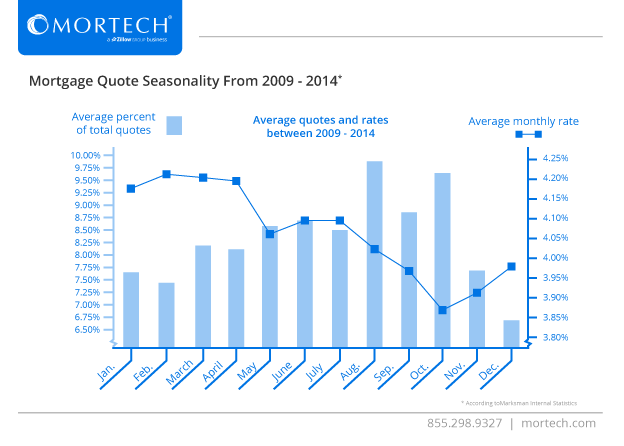 So, unless a rate is wildly different, seasonality is going to play a major role in quote volume. What does this mean as summer approaches? Given the trend of the last few years, it’s time to start gearing up for increased quote volume. Keeping an eye on rates is obviously a factor, but provided they keep trending in their current direction, you can expect volumes to move up the curve again. And to handle those volumes, you can turn to Mortech for better tools and processes to handle the increased amount of leads, and convert more of them into your borrowers. Talk with us today to find out more.